I am a 4th year Mechanical Engineering student who loves to build robots while learning how to use new electrical and mechanical components. HEY ben , ive been interested in your work , and i was wondering what software you used to make the chipper boards. The PCB was made with CadSoft Eagle. 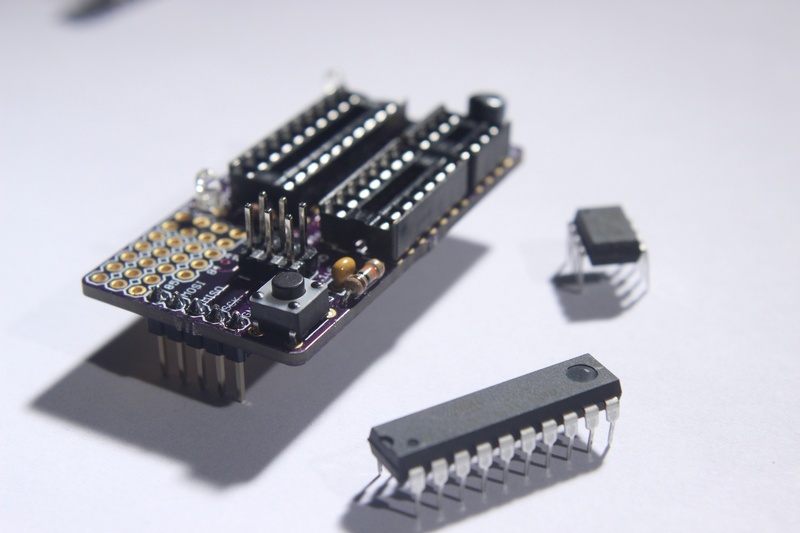 The chips are programmed with the Arduino IDE. was your kickstarter a success ? So far it has been going according to plan! Hello, Ben. Tell me, please, will your board works on Arduino Leonardo? It will not work if you place the shield on the Leonardo. What you have to do is connect the 6 pin header on the Chipper to the 6 pin header on the Leonardo. Then it will work with the ArduinoISP sketch. 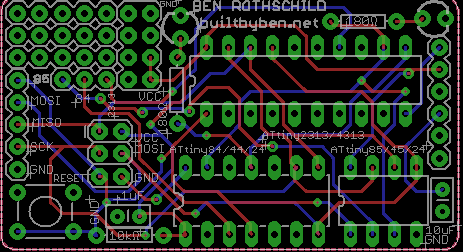 Please email me at benrothschild@builtbyben.net and you can order a board and ATtiny chips. Is it possible to get the schematics in pdf format? Yes. Please check the Chipper Circuit Board files on GitHub. Uhhh… I looked on the site for the link to it, but couldn’t find the link to gethub. Could you point it out to me real clear like, ‘cuz I aint one for tact — I need it right out in the open to find stuff. It was mailed out today. It should arrive within 3 weeks. Hi Ben, I also paid you through paypal, but have not heard back from you. Can you update on the shipment please. Hello, Ben. Do you have any tutorials on how to test input and output on the analog channel, with the Chipper? I inherited one from a friend and have not electronics experience, but have lots of code experience. Hello, Ben Im a IT teacher working in a public school. Im showing my class your boxhead creation. Do you have a link to the images please.